What was to become Hampton Hill was originally the southern corner of Hounslow Heath, used as common land to graze animals. It was a haunt of highwaymen and footpads, with a gibbet for the punishment of these criminals on the corner at the Hampton Hill end of Burton’s Road. The Commons Enclosure act of 1811 allowed parts of this heathland to be enclosed and the land, which is now between St James’s Church and Hampton Hill High Street, was converted into glebe (land providing income for a clergyman) for the benefit of St Mary’s Church, Hampton. During the early 1860s the Thames Valley Railway Line was extended, the Hampton Water Works was built and the local nursery trade developed. These projects brought an enormous number of rowdy, hard drinking labourers and artisans into an area with terrible conditions, many people living in “miserable hovels”. They helped to increase the number of public houses in the district to thirteen, these being the scenes of not a few “public affrays”. There were no facilities or services in the area and consequently poverty, drunkenness and violence were widespread. The shacks in which these people lived gradually developed into a community on the common and it was described as “a wilderness with a number of habitations of the most wretched kind, inhabited by a still more wretched class of people”. Why was St James's church built? The Revd James Burrows, MA, was appointed vicar of St Mary’s, Hampton, in 1861. Within a year it was decided that a new church, the District Chapelry of St James, should be built to cope with the above mentioned appalling situation and serve the scattered village of New Hampton situated a mile or more away on the hill above Hampton. The mother parish of St Mary’s gave some of its glebe land for this purpose and a simple church, with a nave, a chancel and a small vestry room, was built. When it was finished Revd Fitzroy John Fitz Wygram was appointed vicar, and the building was consecrated on December 11th, 1863, by Bishop Tait, Bishop of London. 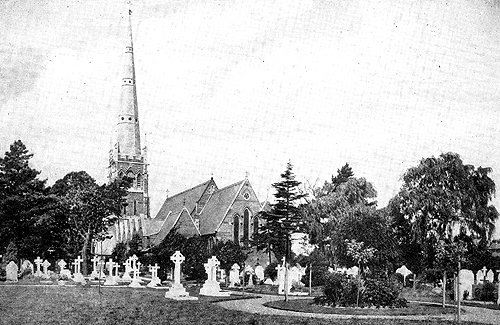 The Common, as our area was then called, was described as “a miserable area inhabited by an even more miserable brand of people” and the little district chapelry of St James as “a barn of a church in a wilderness of a parish”. 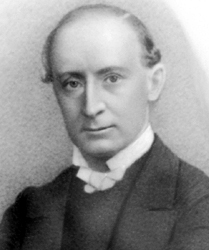 Revd Fitz Wygram and his wife devoted their lives and much of their fortune in improving the living conditions and prospects of the parishioners. Consequently, matters speedily improved and people started flocking to worship in the little church. 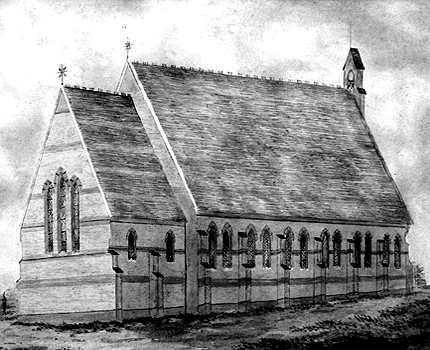 By 1873 the population had grown to 1,400 and more space was needed in the church. So during the next twenty years there were many alterations and extensions which changed the little barn into the gracious building we know today. The north aisle and west porch came first, their stained glass windows dedicated to well-known parishioners; an organ chamber and a splendid organ was given by the vicar in 1874; the present vestry was added; the chancel was enlarged by eight feet and tiled in 1876; and the beautiful stained glass window was installed above the altar. The south aisle and porch, in 1879, were the last of Rev, Fitz Wygram’s additions as he died in 1881. To celebrate Queen Victoria’s Golden Jubilee in 1887, the tower and spire were planned. 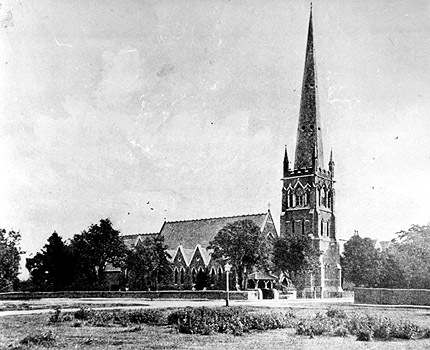 Funds for the tower came in and that was built, but the spire was not completed until 1888. The clock and the four carillon bells were installed in December 1893. Two more bells were added in 1902. More stained glass windows were added in the late 19th and early 20th centuries. Those of the south aisle are notable, depicting various parables, while those in the north aisle are more muted, but are fine examples of the period. The great east window represents the Ascension, flanked by the Nativity and the visit of the Magi. The most memorable, however, is the west window, 'The Transfiguration', provided by the parishioners as a memorial to Revd Fitz Wygram. The marble pulpit was given by his successor, Revd Henry Bligh. Four beautiful mosaics depicting Christ the King, St James, St Michael, and Mary with the infant Jesus were placed in the nave in the early 20th century. The interior of the church remained largely unaltered until 1963 when it was brightly painted and varnished. The pews were removed from the south aisle in 1970, giving extra space and also room for storage cupboards. In 1983 the chancel was extended into the nave with an apron stage, the upper section of which could be raised for dramatic performances. Later came a complete redecoration of the interior, the installation of a new wiring and lighting system and at the same time the stonework was thoroughly cleaned. In 1991 the pews in the north aisle were replaced by separate, comfortable, movable chairs. The children’s area was also located in the north aisle, with books, toys and games. The prayer corner with seating suitable for small meetings was moved to the north aisle in 2010. Further seating could be provided by stackable chairs in the south aisle, allowing for a very flexible seating pattern with the church being capable of seating about 360 people. The 1979 sound system was brought up to date and then during 2011 underwent a further major upgrade with new microphones, an additional speaker and facilities for audio recording and use of tapes and CDs. In September 1994, the new church hall was opened, a new garage was built for the vicarage, and the old garage given to provide storage for the Nursery School. In 2004-5 the small and little used west porch was rebuilt on a larger scale to provide a new parish office and small store room. The entrance has a glass roof, and two sets of double glass doors give an open view into the church from outside. 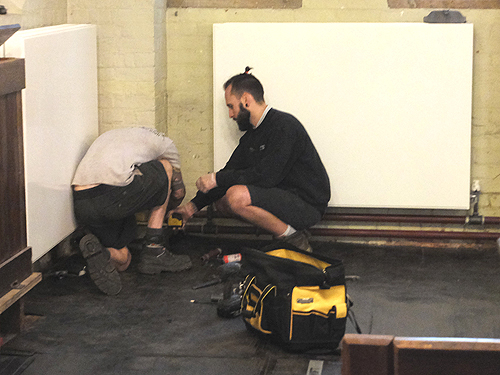 The church heating system was replaced in the summer of 2014, boilers for both the church and hall were installed and new radiators and pipes were fitted. A water pipe was also laid into the vestry, allowing for a basin to be installed at a later date. A big screen was installed in 2016 as part of a package of church improvements planned to enhance church use and worship. The work also included another upgrade of the sound system and a new induction loop for anyone with a hearing aid. These provide a huge opportunity to enhance services and events. Through 2017 there were major works on the church building. Two toilets, one suitable for wheelchair users and with baby changing facilities, were built in the west porch. The glass exterior doors were replaced, cupboards for Fair Trade stock were created in the hall and new notice boards were hung in the hall corridor. The vestry furniture was upgraded, storage rationalised and a sink and also power sockets added in the vestry. Extra storage cupboards were installed in the children’s area and new tables were added. Major work to renovate the organ took 16 months. In the autumn of 2017 the clock faces were restored and repairs were carried out on the tower. New notice boards were installed at the west porch entrance and the outside south doors were painted. 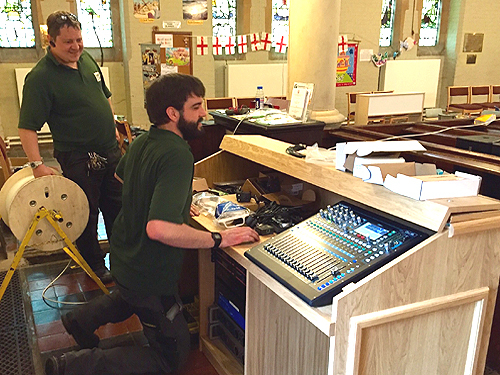 Low surface temperature radiator guards were fitted in church early in 2018. Detailed information about all these developments and more can be found on the page The church buildings through the years. Originally the churchyard was just the area immediately surrounding the church. 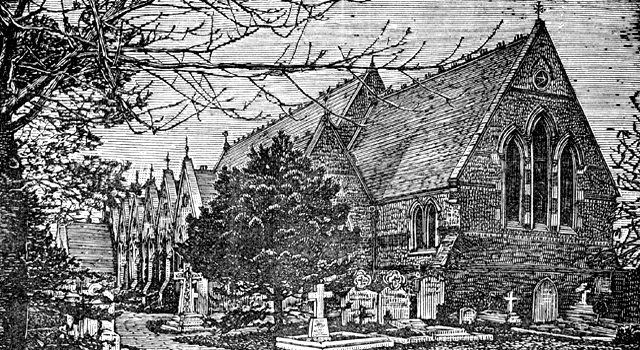 However, because of the growing population of the new parish, this was found to be too small so in 1882 the vicar of Hampton gave an acre of land next to the church in Park Road to be used as the parish burial ground. Thus the churchyard now covers an area of approximately 1.6 acres and contains about 1200 known graves. The older part of the churchyard has many fine rare trees. The War Memorial, listed Grade 2 in 2015, was erected in 1920 and near it are the Canadian war graves, needed when the Canadian Military Hospital was situated in Bushy Park during the 1914-1918 war. 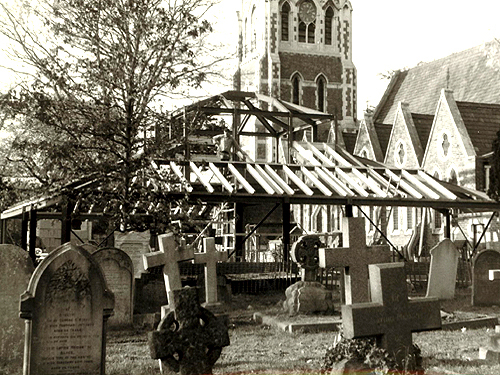 The lych gate formerly stood nearer St James's Road but was moved to its present site in the early 1900s. The lych gate formerly stood nearer St James's Road but was moved to its present site in the early 1900s. Since 1992, the churchyard has been closed for burials except for reserved places in existing plots, though the interment of ashes is permissible. 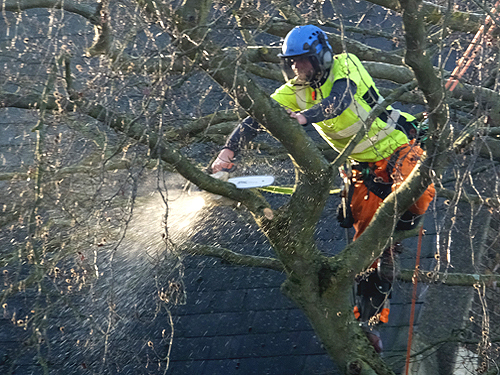 The maintenance of the churchyard is now the responsibility of the Local Authority. In January 2017 the copper beech, on the corner of St James's Road and Park Road, became unsafe after being attacked by a giant fungus and had to be felled. A new bench made from beech wood was installed by the south porch. It was given to the church by the local council after they had cut down the tree. A new Gardening Club started in December 2017. Various parts of the churchyard were tidied up and a large area was prepared for spring wildflowers. 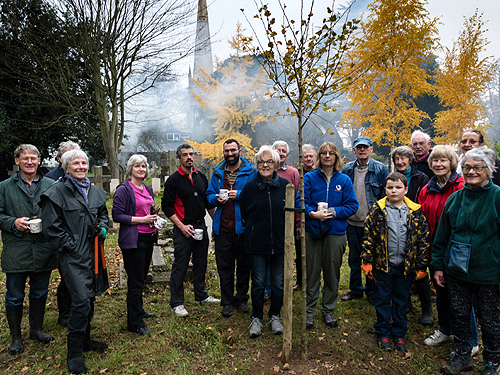 Four trees given to the church by the Mayor of London’s 'Trees for Sacred Spaces' project had been planted earlier. In the spring of 2018 the area around the bottom of the tower was cleared and shrubs and daffodils planted. Detailed information about all these developments and more can be found on the page The churchyard through the years.